Step 1 Preheat a grill pan over high heat. Step 2 Bring 2 cups vegetable broth and butter to a boil in a small covered pot. Add rice, reduce heat to low and cook 18 to 20 minutes, or until rice is tender and liquid is absorbed. Step 3 Split peppers lengthwise and remove seeds, leaving stems in tact. Grill peppers on hot grill pan for 3 to 5 minutes on each side. Remove from grill and let cool enough to handle. Step 4 To a medium skillet over moderate heat, add 1 tablespoon oil and onion. Saute onion 2 or 3 minutes. Add cooked rice to the pan and stir in peas and taco sauce. Season rice with salt and pepper. Step 5 Load up pepper halves with seasoned rice. 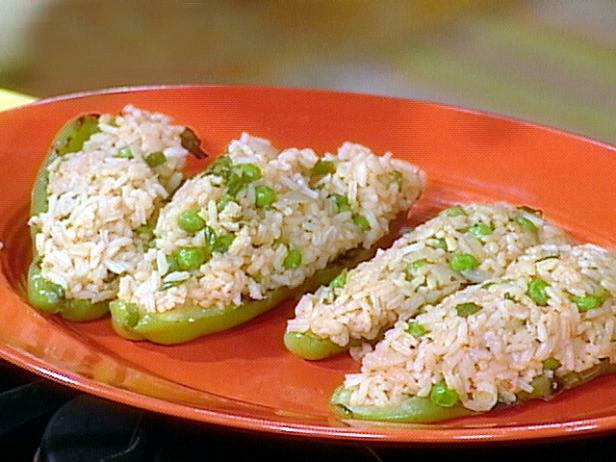 Top rice filled peppers with chopped cilantro or parsley and scallions.